Aiming to reduce your kitchen waste? Or even working on a zero waste kitchen? 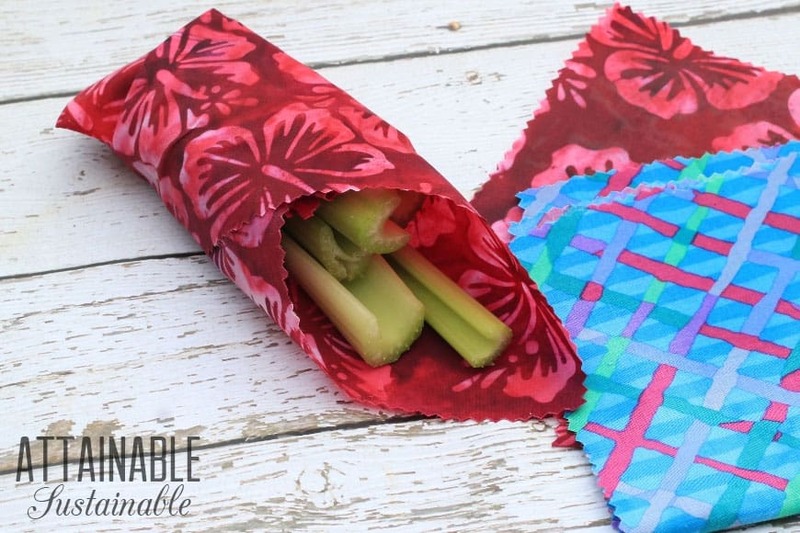 Make your own beeswax cloth wraps to replace cling wrap and plastic bread bags! Plastic cling wrap and plastic bread bags are often one of the last barriers in reaching the goal of a zero waste kitchen. You can save money and avoid endocrine disrupting plastic with a reusable beeswax wrap. Plus, once you see how easy it is to make your own beeswax cloth wraps, you can make any size you need, whenever you want. This project uses four fat quarters from your fabric stash or about one yard of 45″ wide fabric. (A fat quarter is a 22″ x 18″ rectangle of fabric.) If you don’t have a fabric stash, utilize any 100% cotton, hemp, or linen fabric that is medium weight but not sheer – about 3.8 to 4.5 ounces per yard. Choose fabric that is about the weight of cotton muslin, gingham, broadcloth, or quilting fabric. I prefer cotton that is a little heavier than the fabric used in the commercial beeswax wraps for greater durability. You can find a wealth of material to repurpose for this project at thrift stores or garage sales. Look for household linen such as table cloths, napkins, bed sheets, and medium weight fabric. Before you start, lay down newspaper or a drop cloth over your work area and over the floor where you’ll be working. If you do accidentally get beeswax where you don’t want it, allow the wax mixture to cool completely, then apply an ice cube to the wax and it should lift off any hard surface. Rubbing alcohol or D-limonene will dissolve unwanted beeswax, with a little elbow grease. Beeswax is flammable. Don’t melt wax over direct heat. Instead use a double boiler to melt it. Watch garage sales or thrift stores for a second-hand double boiler that you can set aside specifically for melting beeswax. Alternatively you can create a makeshift double boiler using a sauce pan with water in it, and a glass jar that you don’t mind sacrificing to beeswax crafts. (Once you melt the beeswax and pine pitch in the jar, you won’t get it clean again.) Place a canning jar ring in the bottom of the pot with the water to support the jar and keep it off the bottom of the pot. This recipe makes four 18″ by 22″ food wraps that are big enough to cover a bowl, a loaf of bread, or a casserole dish. 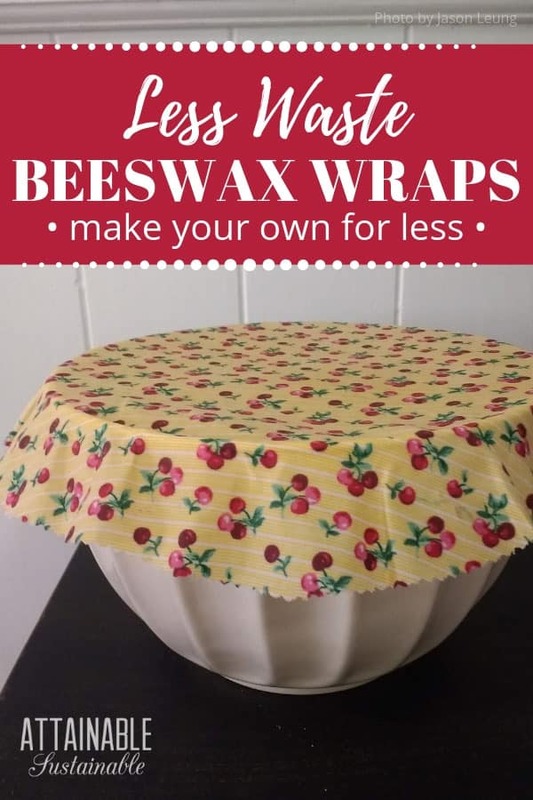 You can easily double the recipe and the amount of fabric to make beeswax food wraps for a friend, too. These make valuable and thoughtful gifts. Why use pine resin in beeswax wraps? While some people omit the pine resin from the recipe, it’s the pine resin that gives these wraps the grip to cling to glass bowls like cling wrap. You can get pine resin on Etsy but buying directly from the company will save you money. Pine resin can be used for other do-it-yourself projects like making pine salve or waterproofing for traditional oil cloth. Prepare four fat quarters by washing well to remove the sizing. Hang these to dry. Press them with a steam iron to remove any wrinkles before waxing. If desired, you can finish the edges with a zigzag stitch, a serged edge, or simply cut the edges with pinking shears. Melt the beeswax and pine resin together in your double boiler. Drizzle the jojoba oil into the liquified mixture while stirring. You may need to scrape the pine resin off the bottom and stir it into the beeswax once the mixture is melted. Keep this warming in the double boiler while you work with one piece of fabric at a time. Place a piece of parchment paper on a baking sheet. Preheat the oven to 225°F. Working with one piece of fabric at a time, place the fabric in a single layer on top of the parchment paper on the baking sheet. Using a wide paint brush, wipe the beeswax mixture onto the surface of the fabric to make your first DIY beeswax wrap. Place the baking sheet in the oven. Leave it only long enough to melt the beeswax. The beeswax mixture will melt into the fabric and spread. Once the fabric darkens and glistens showing that the beeswax is fully melted, remove the baking sheet from the oven. Use a brush to make sure the beeswax mixture fully saturates the cloth. It may pool in some areas and leave other areas drier. Move the wax around the fabric, using the paint brush, as necessary. Use another piece of your fabric to blot excess wax by setting it on the first piece. When the fabric is saturated with the wax mixture flip the fabric over on the baking sheet. The blotting fabric should be on the bottom. That second piece of fabric will absorb the excess wax. Using your hands on the warmed fabric, work the excess wax into the less saturated areas of the fabric. Return the baking sheet to the oven, briefly, just long enough to liquefy the wax. Remove the first fabric from the baking sheet and drape over a clothes rack to dry. The blotting fabric is now your working fabric. Use a brush to spread more of the beeswax mixture around on the fabric. Cover the fabric evenly with a thin layer of the wax mixture. Place the baking sheet in the oven to melt the wax. As soon as the wax is liquefied, remove the baking sheet from the oven. Spread the melted wax around with a brush. Blot the excess wax from the working fabric using a new piece of fabric. Again, flip the fabric over so that the blotting fabric is now on the bottom. Return this briefly to the oven to re-liquefy. Remove the working fabric to a rack to dry. Repeat with more squares of fabric going through the process one at a time, and blotting the excess wax onto the next piece of fabric. Allow the beeswax-impregnated fabric squares to dry fully. Once dry, wipe both sides of each piece of fabric with a damp cloth to remove any residual wax or resin before using. 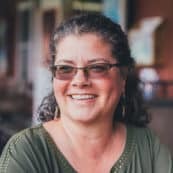 Using beeswax wraps in your zero waste kitchen. A DIY beeswax wrap can be used in place of plastic cling wrap or wax paper. The beeswax can be warmed in the hands and will conform to the shape of a bowl, casserole dish, or a loaf of bread. It will cling to itself. Wash in cool to warm water, using mild “green” dish soap. Don’t leave it sitting in the water, as this will weaken the bond, and shorten the life of the wrap. Hang to dry. Fold and store. Do not machine wash. Do not wash in hot water or in the dishwasher. Be sure to check out Chris’s book, The Beeswax Workshop: How to Make Your Own Natural Candles, Cosmetics, Cleaners, Soaps, Healing Balms and More. 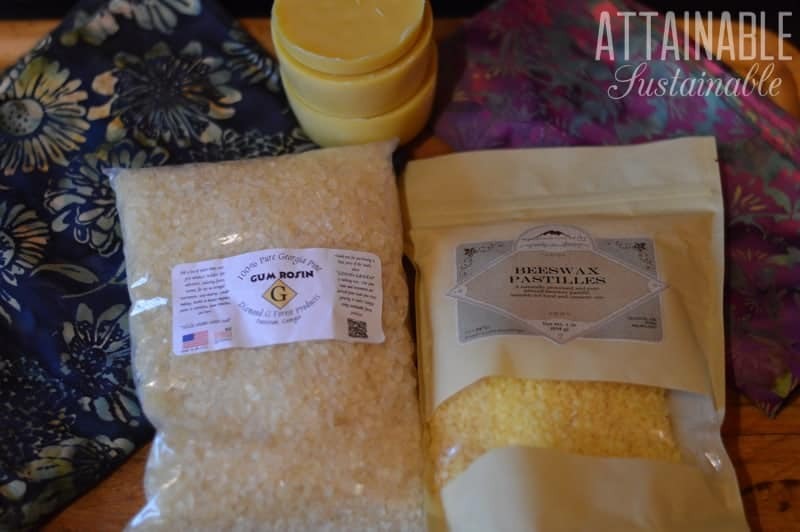 It’s an entire collection of recipes and projects using natural beeswax. From household cleaners and beauty supplies to items perfect for gift giving, this book will come out again and again as you transform your household into a greener, more self-reliant oasis. Dilly Beans — Fresh From the Garden Goodness! what is the life span of these? Both the beeswax and the pine resin last a long time without degrading. Centuries if kept dry, according to samples found in Egyptian tombs, and on iconist art from the first century. The jojoba is actually a wax and doesn’t go rancid like liquid oils. Your biggest problem would be if the fabric that you use degraded from exposure to sunlight, which can take years. So I think you’d be fine for at least 5 years. There is no shelf life, per say. When you’re ready to put this in the compost pile, it will degrade like other natural products in the presence of worms, bacteria, soil and moisture. I made these today and they turned out AWESOME! It was surprisingly easier and less messy than I had expected. How long do I let them dry? Storing the ‘treated’ fabric: cool dry place, roll I assume for the longevity of the product? I would think that would help, yes! I keep mine folded in a wicker basket on the counter so I remember to use them. The fabric is very flexible. I haven’t noticed any wear. Beeswax doesn’t crackle like paraffin wax. 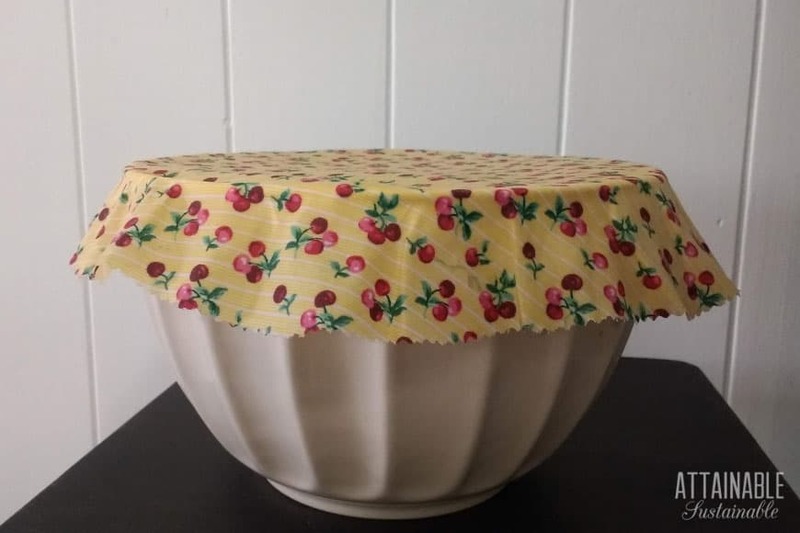 If you do notice any wear, slipping them back in the oven and brushing the wax around again should fill in any weakness, provided that the fabric has integrity. While I need, and definitely plan on making, some of these, do you have any suggestions for storage of greens (anything that would wilt without a plastic bag) in the fridge? Would a variation of these work for that application, do you think? I’ve found the best way to store vegetables like lettuce and things like herbs, is to put them in glass ‘Tupperware’ and place a damp piece of kitchen paper over the top, closing them up and refrigerating them. Great tutorial, can’t wait to try it! Would this work as a liner for re-usable sandwich bags? You could make reusable sandwich wraps with this. Just vary the size of the fabric. You must be a genius! Love your instructables! Thank you! Fantastic tutorial. I’m excited to give these a try. Thank you for sharing it. Seems do-able. Will give these a try! I am getting very frustrated here as try as I might, I cannot persuade the rosin to dissolve in the oil/wax, and mine is powder to start with so I’m not even working with lumps. Is yours actually dissolving, or just particles in suspension? I stir with a chopstick, and end up with a blob of toffee-like soft resin on the bottom of the chopstick. I have tried leaving it for some hours in the double boiler, stirring regularly, but still no luck. I have made wraps with just beeswax for some time and really wanted to get the tackiness of the resin into them. I am beginning to wonder if it’s possible to have the ‘wrong’ sort of rosin! Thanks for any suggestions – yours look so good and I am envious. I’m sorry that you are having trouble with the recipe. Might you be at a high elevation? 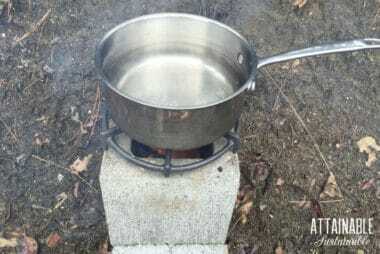 I’m at 2700 ft. and my water boils at 187F. The pine resin forms a blob in the bottom of the glass measuring cup I use as a double boiler. But pine resin naturally dissolves in oil so when I stir it, it does dissolve. It doesn’t take long when I stir it. I’ve tried this with pine resin that I’ve gathered locally as well as the lumps of pine resin (kind of a coarse, flaky powder) from Diamond G. Forest Products in Georgia. Theirs is called Gum Rosin. But it’s Pine Resin with the turpenine volatile oils boiled off. I wonder about your elevation because the Pine Resin liquifies at 90 to 100C (212F). But the higher you are, the lower the temperature that your water boils at. You might need to put the glass measuring cup directly on the bottom of the pot, so that it gets a little hotter than the boiling water in the pot. You want to get the pine rosin to reach 212F. It should melt when it reaches the appropriate temperature unless it has fillers added. Since it’s making a sticky blob on the end of your chopstick, it sounds like it’s behaving normally and just needs a slight increase in temperature to dissolve all the way. Thanks, I think we’re about 150ft above sea level, quite near the coast in fact – Adelaide in South Australia. I have just ordered some different rosin to try, in case my rosin is the issue. 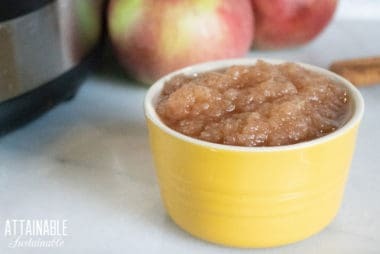 It’s good to know that yours goes through the ‘toffee on the stick’ stage but I haven’t been able to get mine past that to dissolving – I used a slow cooker, then wondered if that was not hot enough and had my jar over actual boiling water. I’m determined to crack this one and I’ll let you know how I go. Ah that would be metres above sea level, not feet…. I found that I needed to keep it boiling for a good long time before the resin would dissolve. I was interrupted in this by my toddler and left it sitting in the pot for close to 20 minutes (I turned the burner off when I left) And when I returned it all but dissolved. I’d love to know if you ever figured this out! I’m having the same issue. I heat mine in the microwave and it’s evetually melts. Just keep heating and stirring. I also use the fat end of chopsticks to stir it. How do you store your beeswax wraps? Brianna, I just fold them and keep them in a kitchen drawer when not in use. Thank you so much for the suggestion. I will try it for sure. I have already made some bags for the fruits and vegetables at the grocery and I love them. So it will be a good continuation. I’m thinking of doing some sheets of material as well as making a few bags large enough for a loaf of bread and a half dozen smaller ones for hubby’s sandwiches. I found “balsam fir gum”… is it the same insted of the pine resine ? Can you just make these and sell them?! As you are in BC, as I am, where do you get your beeswax and pine resin? Do you collect it or is there a good place to buy it from? Also, must it be jojoba oil or can you substitute other oils? This is very interesting. It makes me think of “oil” tablecloths. Somehow people used to have tablecloths that were more than a piece of cloth, which would be dirty after every meal and need laundering. Can the surface of this wrap be wiped off? It would be great if a person could apply the pine resin to one side only (to grip the table) and leave the other side smooth and wipeable. I have never done anything like this and wouldn’t have a clue how to do such a large project. Everything I have seen advertised as oilcloth is just flannel backed plastic which cracks after only a few months. Your thoughts are appreciated. What purpose does the jojoba oil have in this recipe? thanks. Can these be frozen? I am wanting to use them for meal prepping but don’t know if they are freezer safe. Hi I tried to make the beeswax wrap using 100% cotton. But compared to the commercial one my one feels very soft how do I make it firmer? The cost for the resin is the same from both places. Diamond Forest Products charges shipping which makes it the same as Amazon’s price, but if you have Amazon Prime you will receive it much faster. Greetings from the Central Highlands of Tasmania. I realise I’m probably a little late to this conversation, but just discovered this tutorial via pinterest. I have seen wax cloths for sale, but they are crazy expensive. I work a lot with textiles including batik and am aware of how beeswax behaves on all types of fabric. When I have looked at recipes to make wax cloths they contained only beeswax and I was sceptical about how long they would last and how soft the hand would be (ie how malleable and clingy it would be), also the methods used didn’t seem appropriate. So I click on the link to your blog and BAM! A recipe that makes sense AND a technique that reads like it would create the malleable, clingy, durable cloth I’m after. I’ve got plenty of lovely cotton fabric scraps so I will be making a heap of these and giving them as gifts to friends. The challenge will be getting my husband to use them but I do most of the shopping so when I just stop buying the stuff and will ignore his pleadings to “please buy some cling wrap”. At the moment out use of cling wrap is pretty minimal, but there is still more plastic in my house than I would like. I did buy some sandwich wraps from Onya https://www.onyalife.com/product/sandwich-wrap/ which are fabulous, but they are made from recycled plastic and I imagine eventually the plastic inner will crack and need replacing – your wax cloth will make an excellent liner. Your blog is fabulous. I have just subscribed and look forward to your newsletters. I’m am perhaps further down the road to a sustainable life but love to see what other people are doing and how they are doing it. Wow, what are the chances of finding another Tasmanian randomly on the internet!? I want some of these wraps, but don’t want to spend the money that they cost commercially (or buy a whole lot of ingredients to make them)… I’m wondering if you had luck making them and whether you would sell me some at a cheaper cost than the commercial ones? Can they be used in the microwave? Should these be fairly stiff? Does the type of resin matter? Like pebbles vs powder? Pine resin did not melt and mix in. What am I doing wrong? I got the brands you recommended. So disappointed. Just spent hours doing this and the resin didn’t mix in so they aren’t sticky at all. IF I can get the resin to melt at a higher temperature, should i coat them again or ?? Could I just apply a coat of resin? or start over? Everything worked well although I see now I’ve used a different type of pine resin, (a thick / solid in a can that I had to scoop out) and that I hope will work too. It did melt very well with the beeswax. The cloths are still rather damp and sticky an hour after hanging to dry. How long should the drying process take? I wonder if I’ve left too much wax on the cloths or if the natural pine resin is the problem. You might try setting them on a baking tray covered with parchment paper and re-warming them in the oven. The excess should melt off. Do you have the weights of the ingredients? Wax can come in different forms and my resin is a powder. 1/4 cup of pellet wax is not the same as 1/4 cup of shaved or cut up wax. Offhand, no. I’ll try to remember to check this next time I have the ingredients out. Ruth, I found a reference that said 1C of wax pastilles weighed 140 grams. Hope that helps. Actually 1 tablespoon of wax is 12 grams so one cup of beeswax should be the equivalent of 192 grams (12 x 16 = 192). So for this recipe 1/2 cup beeswax is 4 ounces by volume or 96 grams by weight. I hope this helps. Hi Chris, thank you for such a good write-up. I’m just getting started with this project and ready to purchase supplies. But, like Ruth in another post, I’d like to find out how much of the rosin to buy. Can you estimate the weight of 1/4 Cup of rosin? I’m guessing that a pound is well more than a cup, but the key word there is “guessing”. Thank you. Without actually measuring, I’d guess that a pound is actually about 3 cups or so. I haven’t seen it available in smaller quantities, though. You’ll have enough to share! Hi Chris, thank you so much for this recipe. The best recipe for BeesWax Wraps that I have done, but my wraps still leaves a bit of residue when I am using at bowls or glass. Do you have any tips for my problem? What I am doing wring? Thank you! I’m harvesting my own pine resin. How much melted pine resin do you think is equivalent to your 1/4 cup of powdered resin? How cool! (And apologies; I missed this until now!) Let me see if Chris can answer this. Good morning, thank you very much for your post. I have made wrappings with wax only but they break down very fast and I have made your recipe but they are oily to the touch. It seems to me that they are very oily and not very rigid. Does the same thing happen to you? It seems to depend a bit from region to region. You could try laying a piece of cotton on a tray and then setting the oily one on top of that. Then warm it gently in the oven again, to let some of the excess drain off. I know other people who have had luck doing this. It’s (unfortunately) not an exact science. Well, they can get a little bit stiff. I’m going to see if I can get Chris to respond with some ideas for you. It may be that the mixture was too thick on your wraps. Try melting the wraps in the oven and laying another piece of cotton on top to absorb some of the excess. The wraps should be pliable when they are dry and cold and bend without cracking. It may be that you needed more jojoba oil in your mixture. I’m also having the problem of my wraps not being at all sticky. I used copal resin instead of pine resin, and I’m wondering if that’s the problem. I’ll try pine resin next, but… What’s your recommendation on how to repair the wraps I already made? If I sprinkle pine resin directly on and iron them, would that be likely to make them sticky? (I tried that with the copal resin and it didn’t work.) Thanks in advance for your advice – I’m baffled. If it were me, I’d try putting the wraps in a low oven on top of layers of newspaper to absorb as much of the wax as possible. Then recoat with mixture as included in the recipe. I LOVE this idea, and am eager to make some of my own – since becoming more plastic conscious, literally every time I throw any nonrecyclable plastic in the garbage, I feel awful and wonder how it can be replaced with something more eco-friendly! I’m having issues finding pine resin, though… I’ve found a few sellers on ebay.ca and Amazon.ca, but they both specify that it is NOT food grade pine resin. Can I still use them to make these food wraps? Or does it need to be food grade? I would definitely be using these wraps for things like fruit and cheese, where it would be in direct contact with the food, so I feel like it should be food grade.. Is there even such a thing as food grade pine resin?! Help! If you’re uncomfortable with it, you can certainly skip the pine resin — the wraps will just be a little less clingy. Hi! I just tried this and I am super excited to use them! But mine seem to leave a little sticky residue on my fingers when I touch them… is this normal or do I need to fix/redo? Thanks! This may go away as they ‘age’ but I’ll ping Chris. Her daughter is getting married this weekend, though, so she might not respond right away! Hi. I also have the same problem. They leave a residue on the objects and on hands. It comes off easily though so it’s not a big problem. Just wondering if the one’s sold commercially do the same thing. I haven’t experienced the commercial ones, so I’m not sure. Will the pine scent dissipate?? This isn’t something I’ve noticed being a problem, and I used brand new, unwashed fabric. You might try washing the fabric a few times if this is a concern. Why is the jojoba oil used? Can the jojoba oil be substituted? It makes the wraps more pliable than beeswax alone. I’m all for experimenting, but I can’t tell you if another oil will work, as I’ve not tried that. Report back if you do! Renee, did the coconut oil work longer term? 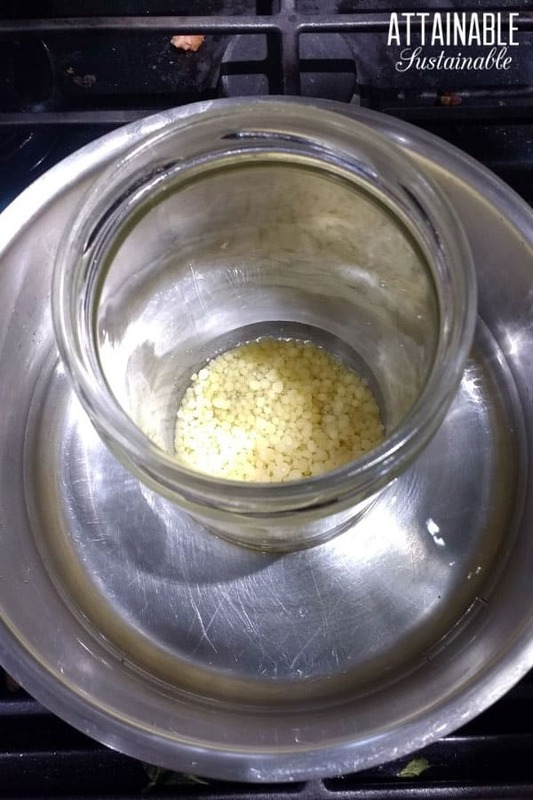 I ran out of jojoba oil but need to make a few other batches – I have coconut oil at home and would prefer to use that than jojoba oil if it works the same 🙂 Thanks for this great tutorial, Kris! I’ve made these twice now after having tried a less successful tutorial before. The only problem I had was when I got to the bottom of my batch, the brush started collecting the hardened taffy-like pine rosin on its tip and then leaving clumps of it on my fabric. Otherwise, really great! The pine resin can be a bit…sticky. Thank you for your post. Does the fabric have to be 100% cotton? It needs to be lightweight and non-synthetic. Glad these worked for you! Hello, I have been making solo beeswax bags for a while with success but always wanted to try the Pine Resin for the fabric sheets as they do not stick usually need a rubber band to keep them in place. My question is can you do this method with the iron, I rarely use the oven for a few reason and have made almost all of my bags with the iron, wondered if anyone has tried doing these with the iron. Maybe brushing with Jojoba oil, then sprinkle the pine resin and beeswax on and iron? I will try a small swatch to see but any advise would be appreciated. I’m actually getting ready to test this soon! I am also curious to know if this is possible with an iron! Yes! You can definitely use an iron. Brush the mixture on, sandwich the fabric between two sheets of parchment paper, and run an iron on low over it until the coating is evenly distributed. Hi. Sorry if this has been asked but why do you need the jojoba oil? The jojoba oil offers pliability. HI, I’ve just tried this for the first time (keen to reduce my use of plastic but findready-made wraps too expensive). I ended up melting my copal gum in the microwave, then adding the beeswax and jojoba oil. At the end I still had a large lump of gum left in the bowl, so I don’t know how much actually got on to the fabric. Could you please advise: is copal gum the same as pine resin? Are there any UK readers who have made wraps and can recommend suppliers? Copal resin *should work. I’ve only used the pine resin, but I found that it melted and blended at a higher heat than required to melt the beeswax, and it clumped up again at a slight decrease in temps. It’s a bit clunky to work with, for sure. I imagine the copal would be similar? This looks like a great idea! I love to make this kind of thing as gift! Hello, thanks for sharing this recipe. I’m curious how you found a sheet pan large enough to accommodate the fat quarter… the largest sheet pan that can fit in my oven is a 3/4 sheet pan or 15 x 21″. I think that’s pretty standard for American ovens. I really want to make the large size for bread and so I’m considering trying to do this with an iron. If you don’t have an oven large enough, you can definitely use an iron. Brush the mixture on, sandwich the fabric between two sheets of parchment paper, and run an iron on low over it until the coating is evenly distributed.